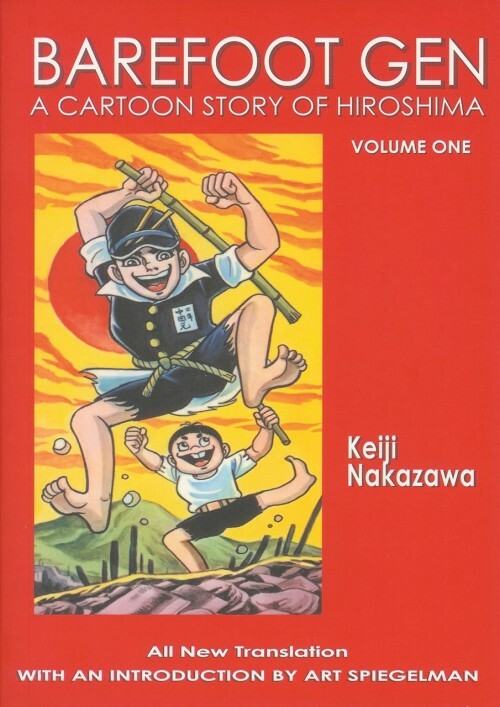 Adafruit’s comic reading list: Barefoot Gen by Keiji Nakazawa #adafruitcomics @riadsattouf « Adafruit Industries – Makers, hackers, artists, designers and engineers! 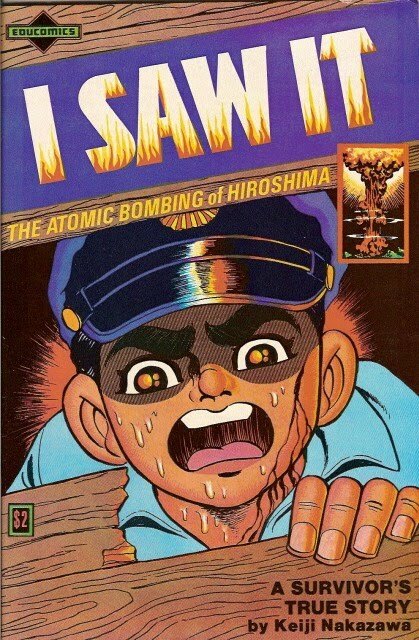 A new edition of Adafruit’s comic reading list — this week it’s Barefoot Gen written up by Shipping Group Director Zay! A brief list of books challenged or banned by schools: The Bluest Eye by Toni Morrison, Saga by Brian K. Vaughan, The Kite Runner by Khaled Kosseini, The Autobiography of Malcom X by Malcolm X, Leaves of Grass by Walt Whitman and…Barefoot Gen by Keijii Nakazawa, a manga memoir about Nakazawa’s childhood in Japan, starting in Hiroshima in August of 1945. I first encountered Barefoot Gen at Best of Two Worlds, a long-gone comic-book specialty store in downtown Berkeley, CA. I was about 10 years old and it was my first encounter with war stories or memoirs, and a fateful one. It doesn’t do what war stories usually do, and that confused me for ages. 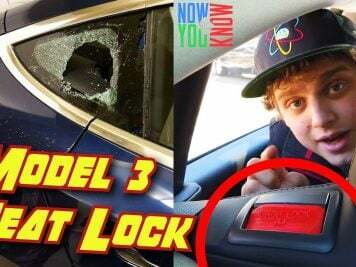 The story is told from the perspective of a poor kid named Gen. Gen’s a kid, with kid pleasures and thoughts and goals. The style of the book works perfectly here. It’s childish and simple, suited for pastoral playfulness. The war itself is relatively far off, and is framed in an unusual way. Even when war stories are critical of the profiteering resource grabs most wars turn out to be, they tend to focus on the transformative life of the soldier, which is all about how boys are turned into honorable, courageous parts of a brotherhood of men. The text might say that war is bad, but the structure of the story shows us the transformative value of the war experience. But after grounding us in a life of poverty created by the very same profiteers who brought Japan into the war, Keijii Nakazawa depicts, with heart-wrenching simplicity, the effects of Little Boy airburst from the ground of Hiroshima. What follows in the book is what led to the book being challenged in schools. It’s graphic, and all the more affecting due to it’s cartoonish simplicity. What was charming and playful when depicting a pastoral boyhood turns into pure horrific terror. The art is so far down the iconographic scale, as Scott McCloud might say, that it sidesteps whatever critical distance you might have. I won’t show the sequence here, but I remember throughout my childhood showing friends this book, as if to confirm what I’d experienced. We would read it together and leave, finally, shaken. And far worse than the way the images are depicted is that the bombing and its effects have no meaning, cause, context, or soldiers to bring any kind of moral vector. It isn’t a depiction of chaos or nature. It’s a depiction of terror in the void. Which is what it felt like for Keijii Nakazawa to be in a poor kid in Hiroshima on August 6th, 1945. And the book is just getting going. Gen’s story ends up being about more than one unimaginable day — it’s about how to find a life once one has been through such a thing. How does one find agency out of this? How does one even begin to fight against that day being the defining moment of your whole life? 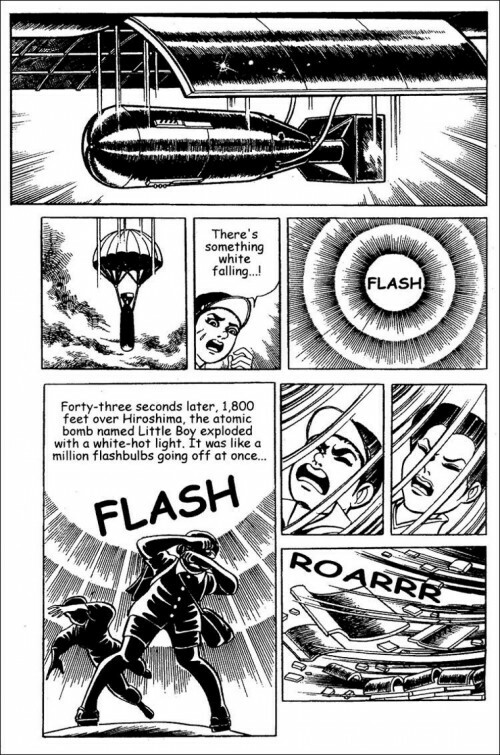 For 9 more volumes, Barefoot Gen works that all out. For the rest of my life, except for the 1985 Soviet war drama Come and See, war stories always seemed a bit hypocritical. War is bad, but oh so action-packed and full of honor. 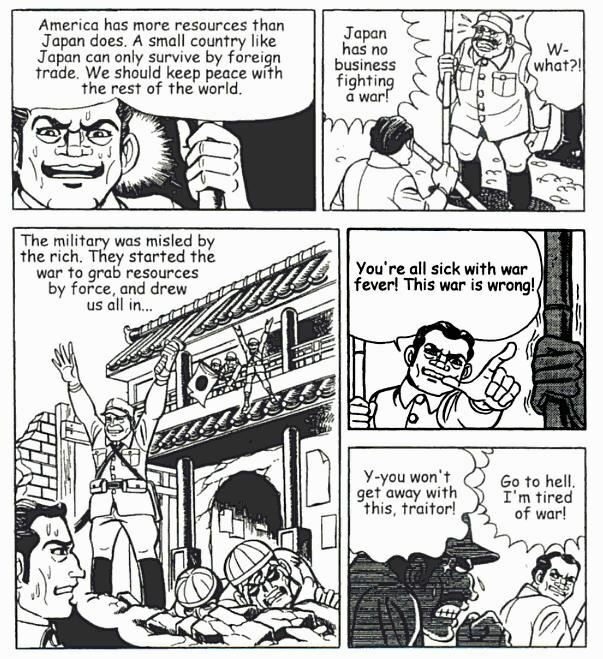 They’re all pregnant with the “war is a force that gives us meaning” subtext — the very subtext that Barefoot Gen annihilates. If your passion for finding alternative ways to resolve conflict or your desire to make the world a better place ever ebbs, pick up Barefoot Gen. It’ll reset the compass. Check out our previous posts Bee and the Puppycat, Spacetrawler, Grrl Power, Krazy Kat, She-Hulk, King City, The Whiteboard, Hubris, Akira, The Wicked and the Divine, Saga, Are You My Mother?, Cairo, Static, Elfquest, Hip Hop Family Tree, Finder, Peanuts, Love and Rockets, As the Crow Flies, Hellblazer, Strong Female Protagonist, Safe Area Goradže, The Legion of Super-Heroes, and The Arab of the Future!